Ants in flower pots generally do not cause any harm, but they are quite the nuisance. They may even be nesting in your flower pot, giving you a serious ant problem in your home. Killing ants in flower pots is possible, but it may take several treatments if you do not just repot the plant. 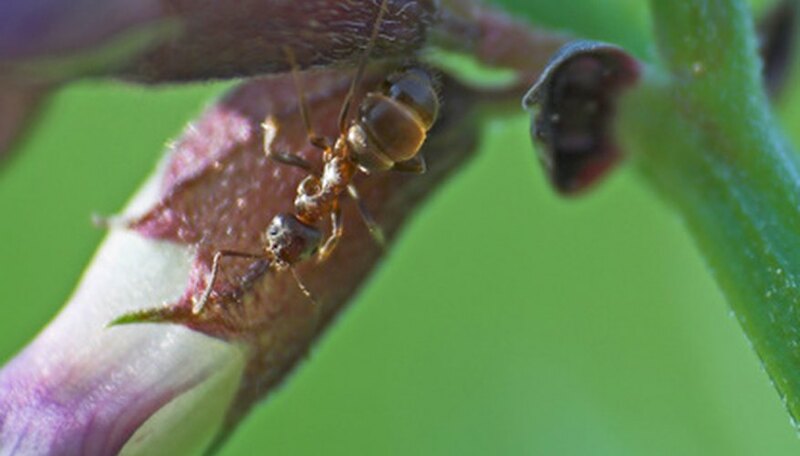 Note that ants may coexist with aphids, which are insects that infest flowers. If you notice plant damage, treat the aphids with an insecticide soap or spray and you might get rid of the ants in the process. Place an ant bait in the flower pot. The ants will take the bait back to their nest (which may be in the flower pot) and kill the colony. Alternatively, make your own bait by mixing 1 part powdered boric acid for every 50 to 100 parts of bait material, such as peanut butter, condensed milk or bacon grease. Place the homemade bait in a bottle cap or small dish on top of your soil in your flower pot. Keep children and animals away from any kind of ant bait. Spray an insecticide labeled to kill ants on top of the soil. Or, make your own with 1 gallon of water mixed with ½ tsp. of eucalyptus oil, 1 tbsp. of vegetable oil and 1 tbsp. of liquid dish soap. Do not spray plant. Change the soil, if possible. Take the plant outside, away from your home, and turn it over to gently remove the plant. Shake off the soil and wash the roots with a hose. Wash the flower pot as well. Replant the plant in clean, fresh potting soil to the same depth as it was previously planted.